a2tix | Rent Party 2019! Rent Party 2019! Join us in our annual fundraiser and our most popular event of the year. This year's Rent Party will take place on Saturday, February 23, 2019 from 8:00 pm to 10:45 pm at the EMU Student Center (Grand Ballroom, 900 Oakwood St., Ypsilanti). Doors open at 7:30. 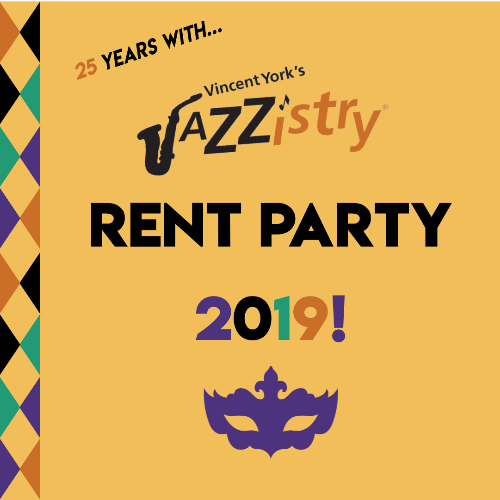 This year's Rent Party features The York University Band and stars R.J. Spangler's Mardi Gras Band! Hors d'oeuvres and cash bar will be available. Tickets are $45 each or $350 for a table of 10 and can be purchased at Jazzistry.org or by calling (734) 761-6024. Come party and dance 'til you drop while you support 25 years of Vincent York's Jazzistry. Let the good times roll!